The Higgins Armory of Worcester, Ma, closed at the end of Dec, 2013 after 83 years. The main hall looked like many a medieval castle we have visited and especially reminded me of The Alcázar of Segovia (literally, Segovia Castle) located in the old city of Segovia, Spain. The art deco, steel-and-glass building was built in 1929 by wealthy Worcester industrialist John Woodman Higgins, owner of the Worcester Pressed Steel Company, whose wife encouraged him to find somewhere outside their home for his growing personal collection of armor. The museum opened in 1931, with Higgins’s metal company occupying the bottom two floors of the five-story building. When Higgins died in 1961, the museum was given to the public, but the Higgins family continued to oversee the collection. In 1979, a public governing board was given control of the armory. Museum staff said that an estimated 58,000 visitors walk the halls each year, including 12,000 schoolchildren. 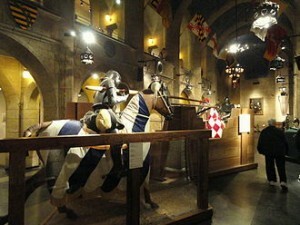 The museum was full of interesting exhibits including many activities for children. Since we went on the 30th, it was over full and far more busy then a ‘normal’ day. Last time we where there, my son was then the age, my grand daughter is now this day in 2013. 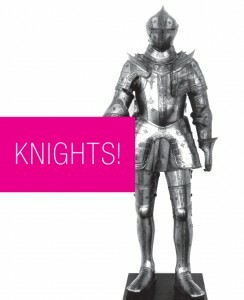 Knights! is a major arms and armor exhibition opening in March 2014. This will mark the first step in the long-term integration of a selection of objects from the Higgins Armory Museum. This significant collection represents objects from medieval and renaissance Europe, Africa, the Middle East, India, Japan, Ancient Greece, and Ancient Rome. This exhibition will showcase these works within the context of other art and artifacts from WAM’s permanent collection, showcasing highlight objects for their unique historic and aesthetic value. The five separate sections of the exhibition (Courtly Pursuits, The Dance of Love and War, Knights of the Round Table, The Arc de Triomphe, and Good + Evil), illustrate in detail the contexts in which these works were made and used. Technology-based interactives, hands-on educational tools, new programmatic initiatives, and innovative family-friendly signage will guide visitors through this landmark exhibition.